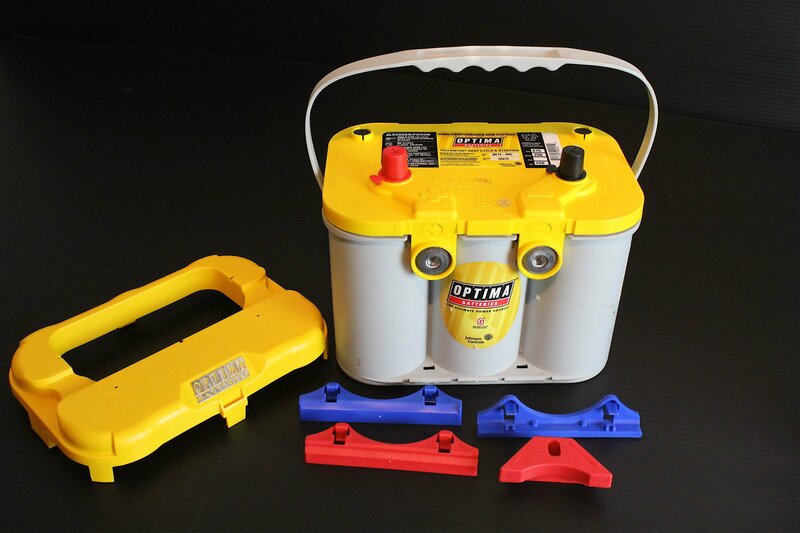 Optima Batteries are easily-recognizable high-performance batteries, with red, yellow, or blue tops and a “six pack” of 2-volt cells. What’s the difference, and why would somebody want any particular size, capacity, or charge/discharge characteristics of one over another? And would anybody really have a reason to use a battery in an off-label application, like using a BlueTop (marine) battery in a show car? There’s hundreds of questions like this swirling around Optima’s trio of juice boxes, so we’re going to walk you through the differences and help you pick the right battery for your ride. Optima’s batteries come in three types, designated by its top and case colors. A “starting” battery will have a dark gray case; a light gray case signifies a deep-cycle battery. RedTop batteries provide high cranking power for vehicle starting, and rely on the alternator to recharge them and run any stock accessories. YellowTop batteries are deep-cycle units, ideal when accessories (sound systems, electric fans/pumps, multiple lights, winches) can overwhelm the alternator’s output. The BlueTop batteries come with both light and dark gray cases; they are designed for marine and RV use. Your typical daily driver probably taxes its battery most when starting; a RedTop is a safe bet, providing the highest “instant-on” power for starting; but if you have a vehicle that uses a lot of electrical equipment – motor-operated doors, pumps, heated seats, a monster sound system – look to a YellowTop. Or if you leave your car parked for extended periods – say, you travel often for a few weeks at a time, or your show car doesn’t go out in the winter, allowing your battery’s voltage to bleed down – go with a YellowTop. Can a BlueTop battery work in a car? The light-case BlueTop is the same as a YellowTop on the inside, but a BlueTop battery has additional thread posts for marine and RV applications. Unless you need the blue color for underhood show, the Red- and YellowTops are recommended for automotive use. RedTop: The right fit for a daily driver or weekend cruiser that sees regular use, and relies on alternators for a regular recharge. YellowTop: A deep-cycle battery perfect for accessories like trailer sound systems, electric fans/pumps, multiple lights, winches. BlueTop: This deep-cycle battery is ideal for marine and RV that are kept in storage for long periods. The lead plates in a flooded or wet lead-acid battery are immersed, close together, commonly in a bath of sulfuric acid (H2SO4). Separators are inserted between the plates, to keep them from touching and shorting out. The electrolytic reaction between the lead plates produces electricity and gas (primarily hydrogen – H and oxygen – O). Some sulfate (from the sulfur – S) is left behind on the plates. Whenever a standard (vented) lead-acid battery is charged or discharged, some of its electrolytes will break down and escape as gas; a portion of the rest remains as a powder that can degrade the plates. In a sealed battery, the elements are retained in the case; recharging the battery will recombine much of the H, O, and S, restoring the battery’s usefulness and avoiding contamination from the outside. Other than a unique appearance, what do Optima Batteries offer, over the standard competition? The most-obvious difference is the SpiralCell or “six-pack” design, which is a byproduct of the “form follows function” philosophy necessary in high-performance applications. Rather than using a more-typical flat-plate arrangement for the lead sheets and separators, Optima’s long plates are separated by an Absorbent Glass Mat (AGM) and wrapped into a cylindrical spiral. These cells are packed, tightly, into the case. Not only is vibration resistance aided by the tight packing; this design also allows more plate surface area, enhancing starting power. Different designs produce different results. In most “starting” batteries, the plates are thinner. This allows for a quicker discharge because you dump huge amounts of current – amps – through big wires to your starter; however, the thinner plates do not tolerate deep or long periods of discharge. A (nominal 12 volt) “starting” battery that discharges and stays discharged for a long time is unlikely to recover. The typically thicker plates in a “deep discharge” battery will not produce quite as much “cranking power” in a short burst, but they can deliver higher currents for a longer time, and also handle longer periods of being run down (but still, not all the way!). So, a “starting” battery will deliver a big punch, fast, and needs to be recharged right away. This is typical with a family car, with few accessories and low current demands. The battery gets things going; then the alternator fills it back up. A “deep cycle” battery will provide a little less-explosive starting power, but it can continue to provide substantial amperage, even when the alternator’s output falls short. Race cars with tiny alternators or big lights, street cars with giant sound systems, and lift- or winch-equipped vehicles are good examples of where a deep cycle battery is called for. Optima’s engineers sweated the internal stuff, too. Here’s one example: the “straps” that connect one cell to the next (turning six 2-volt cells into a 12-volt battery) has a particularly large cross-section, for lower internal resistance. This allows greater starting power and quicker recharging. Two other big things improve Optima’s power density and long life: though most manufacturers in the automotive market use recycled lead, Optima’s plates are 99.99 percent pure – “virgin” lead, if you will. OPTIMA is particularly careful with its electrolyte, too – even the sulfuric acid purity is carefully controlled. The extreme purity of the constituent elements is protected by the sealed case, which also keeps any acid from spilling onto your vehicle. This sealed case makes for true maintenance-free batteries. You just can’t get in there (nor should you!). Because the AGM/SpiralCell construction is so tightly packed, it’s possible for Optima to build higher power density while decreasing the total weight of an average sized battery. This allows a lighter battery to be used, or (for the same weight), gives a battery more power, so you can fit a battery according to your priorities. You can go bigger and get more power, or have the same power you’re used to, and save weight. Batteries don’t like to be shaken and bashed about, so it’s important to mount the battery firmly in contact with the sprung portion of the vehicle, while still isolating it from vibration. In a street rod, direct case-to-metal mounting or a thin rubber pad below may be fine; in a Baja racer, greater isolation is required. The terminals, and particularly the hot (+) terminals, must be insulated. It’s also a good idea to locate the + terminal in an area where it’s unlikely to be pressed into anything else, in an accident. No matter how bad an accident you’re in, it can always get worse, if your battery starts a fire, or it’s cracked and dripping sulfuric acid. All these warnings also apply to your positive-voltage heavy wires and hookups – to the starter and solenoid, for instance. A good ground is also essential, so don’t spare the grounding wires. Even though bolts will conduct electricity, they are unreliable, and develop corrosion when you’re not looking for it. You wouldn’t ask a wire to hold a component in place; why ask a bolt to transmit electricity? Any component that uses a significant current should be grounded, or tied by wire to another well-grounded component. That means your radio rack, engine block, and electronic ignition module all get dedicated grounds. If you have a terminal block, dedicate a ground to that, as well. Treat your battery like the essential, expensive component it is. Optima batteries are sealed, so you have no chance of overfilling them; but other standard caveats apply. Keep your battery at or slightly above its nominal voltage; it’s easy in daily use, with a functioning charging system. Keep the terminals clean and connections tight. Peripherals matter. 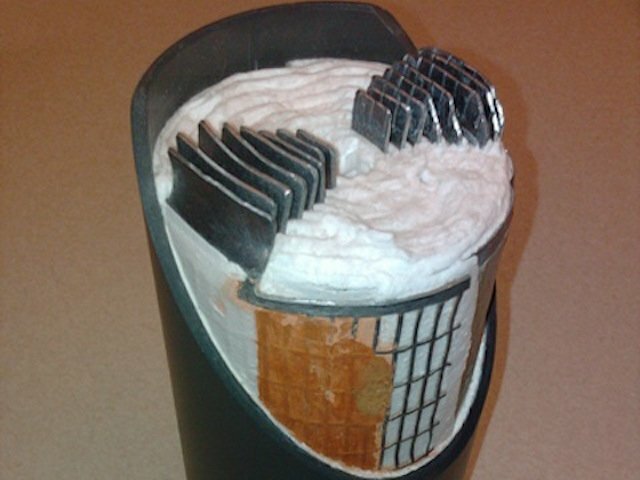 Even purpose-made electric connectors develop corrosion; wires inside them come loose. If these are in your charging circuit, your battery will drain, and your alternator may give up prematurely. Even when you’ve stopped the car and removed the key, your battery will continue to work. Things like radio presets, engine computers, clocks, and other devices with memory all draw some current. Burglar alarms, some GPS units – everything takes a little current, and these little drains add up. Park the car for extended periods, and your battery will run down, but it will go flat slower if you follow good advice and remove the negative (ground) terminal connection. If you’re using the battery infrequently, you can maintain its voltage with a “maintenance charger” or “battery tender,” which gives the battery a low-amp charge (typically under 2 amps). It’s common to leave modern tenders hooked up indefinitely. Often batteries are allowed to be really run down, and battery chargers often have circuitry in them that prevents recharging a truly “dead” battery. A significant number of warranty returns would be unnecessary if everybody knew this. If your charger won’t even try to recharge your dead battery, use this old trick: hook your dead battery to a good battery (in parallel: + to +, – to -) and charge them both together. The good battery’s voltage will very often fool the charger into doing its job. Batteries are heavy, and are sometimes hard to maneuver in their environment; but dropping, prying, and squeezing them won’t extend their lives. When you’re wrestling cables on or off the posts, remember that the other end of that post is fragile – it’s connected to a piece of soft lead! As discussed earlier, batteries don’t take well to being deeply discharged. Though a YellowTop is designed for deeper cycling, running any battery flat will still take its toll. Likewise, overcharging is a crime that serves no purpose. Tough as they are, batteries don’t like to be mistreated. Ignore them and they’ll go bad. Fill them with the wrong stuff, or overfill or overcharge them, and they’ll go bad. Run them flat and leave them, or allow their voltage to stay too long at too low a level, and they’ll go bad. Shake them too hard (and different designs have different limits – see the discussion of AGM and SpiralCell above), or overheat them and they’ll go bad. Freeze them to the point of cracking the case, and they’ll definitely go bad. Lest you think I’m talking about your girlfriend, note that at least with a battery, your proper attention, frequent use, and reasonable maintenance will be repaid with years of faithful service. Optima attends and supports a lot of shows around the country, and one of its displays features owners’ war stories, stories about how their batteries kept working. Like this one, from Steve Kopniske of Parma, Ohio, “On my way to a truck show, I hit an unexpected dip at 70mph and was forced to pull over due to debris flying past my window. When I got out, I discovered my RedTop battery had been jarred loose and was being dragged down the highway. Even though the battery looked destroyed, I wired it back into place. To my surprise, the battery not only worked, but got me all the way home!” If you have such a story, send it on – you might get famous. Ultimately, Optima prides itself on providing a wide array of top-notch batteries for a multitude of applications. Whether for your street/strip machine, the tow vehicle you’re using to haul it to the show or the strip, or the trailer you’re using to haul your ride around in, they’ve got you covered. Now, there should be no reason to keep rooting around for those jumper cables!